Chemical Engineering & Machinery Group Solvent Recovery System | Product Information | KURIMOTO, LTD. 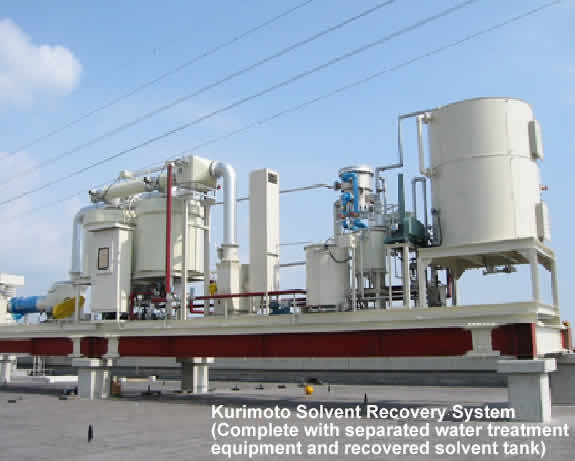 The Kurimoto Solvent Recovery System is a fixed bed type of flue gas treatment equipment using granulated active carbon, which has been developed for the purpose of recovering organic solvent contained in the flue gas. By passing the solvent-containing gas through the granulated active carbon layer, the solvent is adsorbed to the active carbon to exhaust clean air. By blowing vapor into the active carbon layer after the solvent is adsorbed, the solvent is isolated from the active carbon, and recovered after condensation and separation. Providing a high degree of elimination efficiency. Supporting for large changes in inlet concentration. A large amount of know-how and extensive experience. Enabling treatment in the range from small capacity to large capacity. Less running costs, compared to other solvent recovery systems. Solvent and monomer generated from solution polymerization lines. The Kurimoto Solvent Recovery System enables the elimination and recovery of solvent contained in flue gas by performing the following processes in order of "Adsorption", "Isolation", and "Drying". By using two active carbon adsorption towers, the continuous treatment of flue gas is enabled. The solvent-containing gas is sucked by the blower. When the gas passes through the granulated active carbon layer, the solvent is adsorbed to the active carbon, where it turns into clean air to be exhausted. Steam is blown into the adsorption tower from its bottom to purge the solvent adsorbed to the active carbon. The isolated solvent vapor passes through the condenser where it is liquefied, and it is recovered by gravity separation through the separator. The active carbon, which has got wet in the isolation process, is dried by hot air generated through the steam air heater and, then, cooled by air of ambient temperature. 1. The Kurimoto Solvent Recovery System is of unit type. Therefore, the system can support for applications requiring high concentration and large air quantity in accordance with the combination. 2. Each type has the following models. 3. Increased safety explosion-proof type is available on request, which can support for the treatment of flammable solvent. When you make an inquiry about this system, please specify the following.